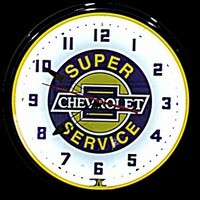 Chevy Super Service Neon Clock 20"
Officially licensed Chevrolet 20" Neon Clock. High quality 1/2" diameter neon glass tubing. Spun aluminum bezel with powder coat finish. Electric clock movement gives accurate, trouble-free service for years of use. Clear and lined glass front never discolors and cleans easily without scratching. Brass pull chain allows neon to be switched on or off while clock keeps running. Replaceable neon tube lasts up to 12 years, even when lit 24 hours a day. 110-volt electric clock movement. Sweep second hand. 20" diameter, approx 6" deep. 8' power cord. Quality heavy-duty construction hand-made with pride in the USA. Weighs solid 15 pounds. 1-Year Factory Warranty.